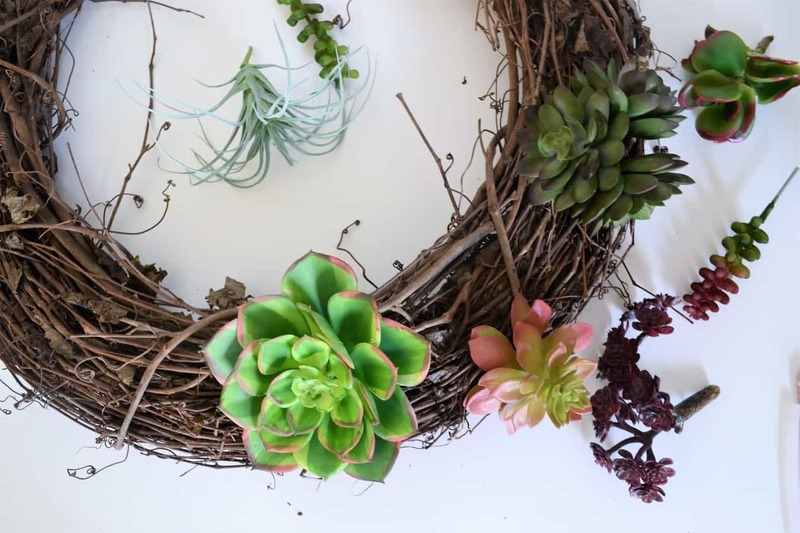 A succulent wreath is the perfect way to welcome spring to your home! 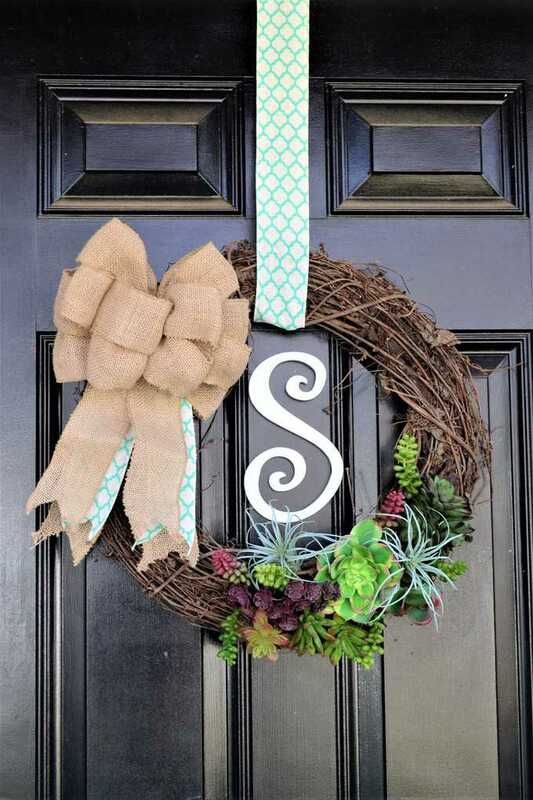 This front door wreath features succulents, burlap and a wooden initial. 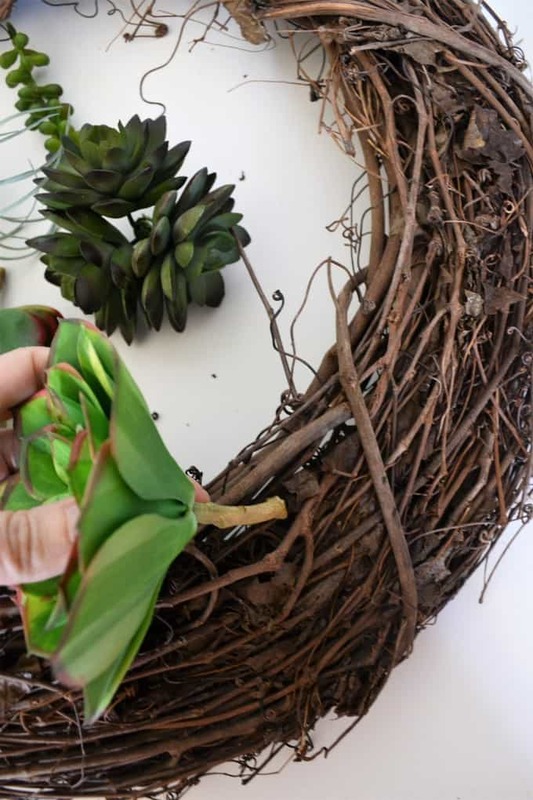 Make this easy succulent wreath today! I don’t know about you, but I am so glad that spring is almost here. There are so many things I love about spring…the switch to iced coffee and flip flops, having the windows in my home open with a breeze blowing, outdoor picnics, and, of course, spring decorating! 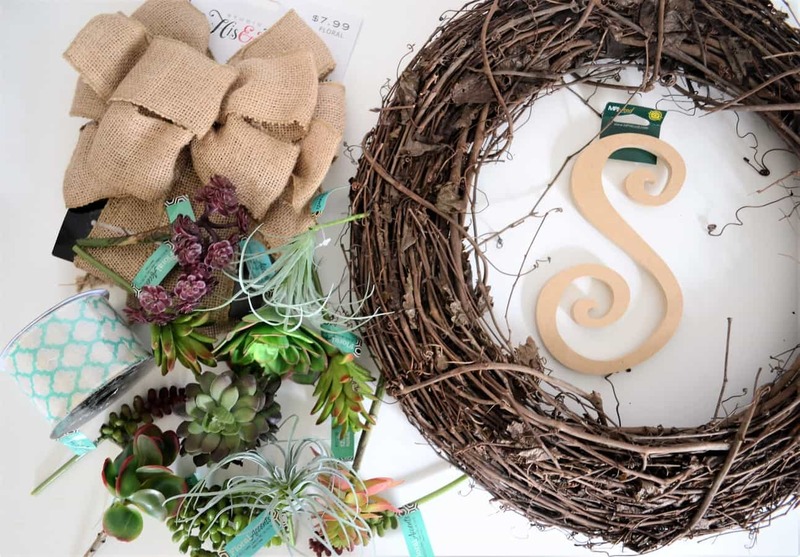 While browsing Hobby Lobby the other day, I became so smitten with their aisles of wreath decor, florals, and seasonal decor, I just knew I needed to create a new, spring succulent wreath to welcome in the new season! 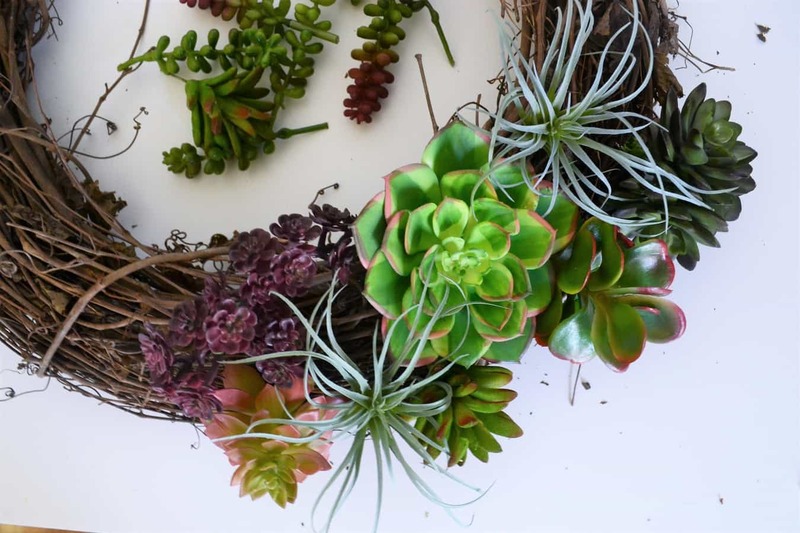 Step 1: You’ll want to start by trimming the stems of the succulents using wire cutters. Next, arrange them on your wreath until you are happy with the placement. I did this by placing the larger succulents first (wait to hot glue them until you are sure you’re happy with the arrangement), then filling in with the smaller ones. Almost done! At this point, I just needed to add in the smallest succulents to fill in any gaps. Once you’re happy with how it looks, hot glue your succulents into place. 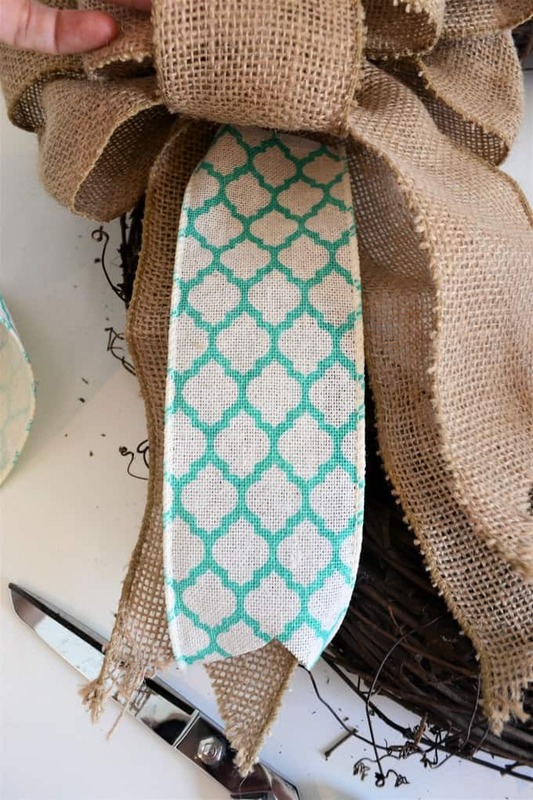 Step 2: Next (and this is completely optional), I used my ribbon to add a bit of extra color to my burlap bow. I LOVE how you can purchase these pre-made bows at Hobby Lobby. It was inexpensive, and I, for one, have NEVER grasped the concept of bow-making. Being able to purchase this pre-made made me so happy! 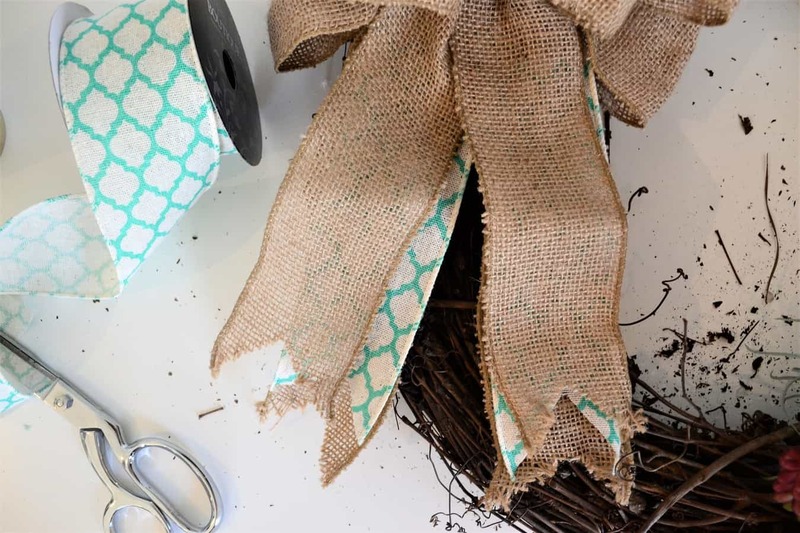 Simply take a length of ribbon, trim the edge, and glue it between the layers of your burlap bow. Repeat for the other side. See how it adds just a little extra burst of color? I’ll use the same ribbon for hanging the wreath, so it’s a nice way to create a cohesive feel. 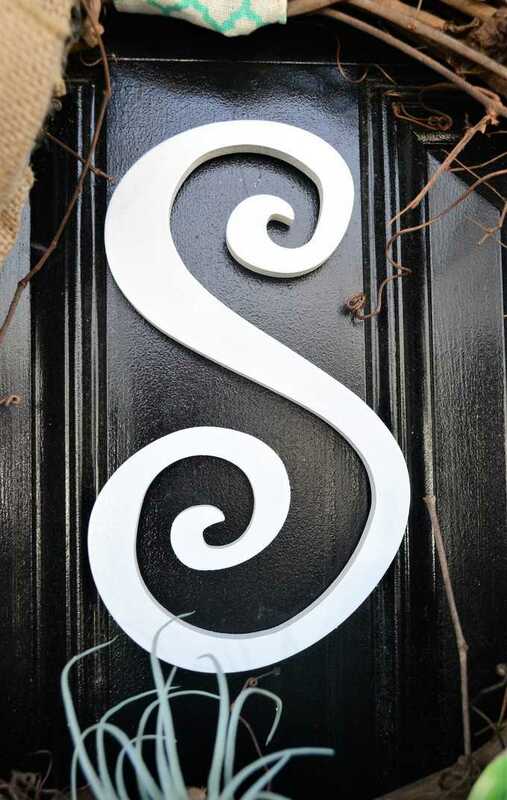 Step 3: Spray paint your wooden initial, if desired. For some added color/pattern, you could also use Mod Podge to decorate your initial with scrapbook paper, fabric, or even glitter! I hung my wreath, then used sticky tape to attach my initial to the center. 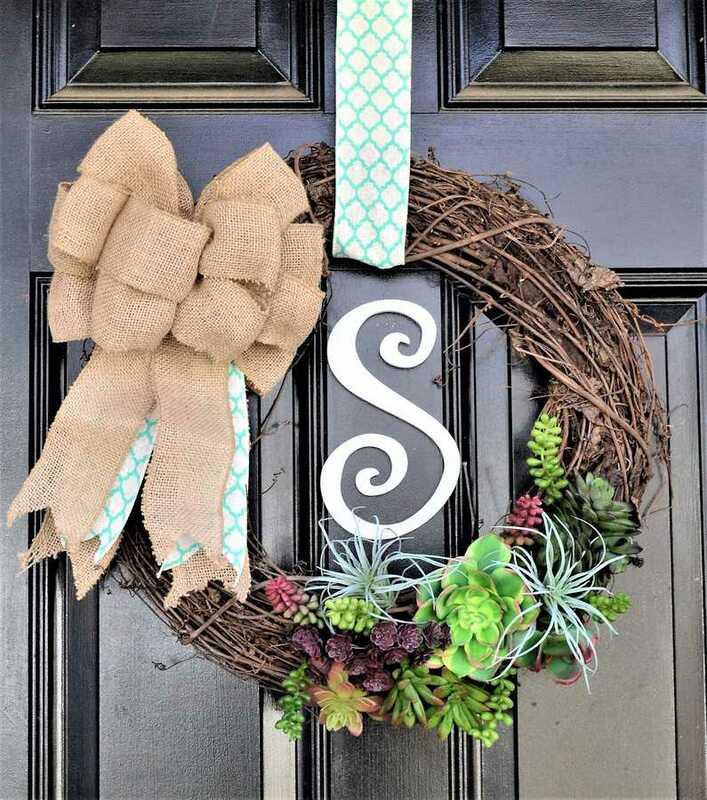 This wreath adds such a welcome pop of color, texture and pattern to my front door, and I love how a quick trip to Hobby Lobby can inspire such simple, yet high-impact, home decor! It’s the perfect way to welcome spring into my home. How do you welcome spring into your home and door decor? Succulents are so popular right now and this wreath is an awesome way to incorporate them into Spring decor. Nicely done! I am SO all about succulents this season – even though they’ve been around. I love them this year!! So pretty! How long will the succulents last?? They are artificial, they will not die. 2 aren’t those fake succulents? Hot glue would just cook any living plant, wouldn’t it? Hot glue would probably not harm real ones, but they’d die without soil and water, use plastic ones. As for the coupon, Hobby Lobby has a new one every week. I didn’t have that problem at all! The ribbon held onto the wreath fairly well. So very pretty! I love it!! Did you tape the letter to center right on the door? Will it damage the door should you need to remove it? Thank you for this delightful Spring element!! So very quiet! I really like it!! Did you tape the letter to middle right on the Lounge Window? Will it damage the door ought to you need to remove it? thanks for this pleasant Spring element!! Hello! I used command tape to tape the initial to the door, it’s “supposed” to come off cleanly, but I imagine part of that depends on how long you keep it on your door before removing it. Thanks! It looks stunning and absolutely lovely. Thanks for sharing on To Grandma’s House We Go! I would want to leave this beauty up year round, it’s beautiful! Thank you for sharing with us this week at Celebrate Your Story, and have a Happy Easter. I discovered faux succulents last year–I LOVE THEM! No watering No nothing! Just cuteness. Phew ’cause I’m a house plant killer. Pinning and sharing! This is so cute! I would like to invite you to link up this post at The Spring and Easter Joys Link Party! It is live now through Monday. Happy Easter! I love to make wreaths, and this one is unique and special. I’m going to have to give it a try! I need a Spring wreath. Thanks for the inspiration! 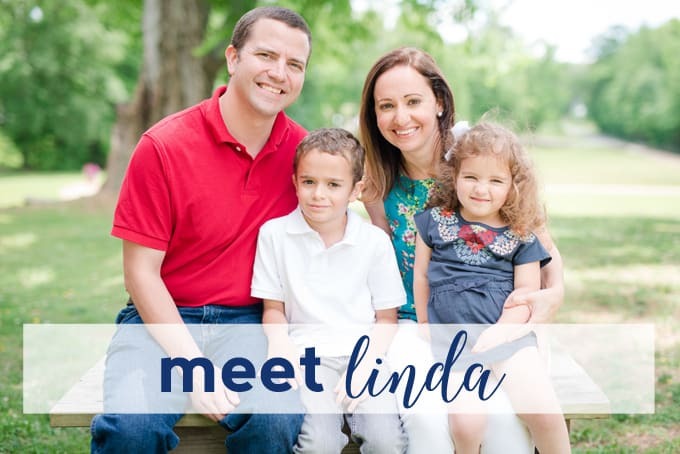 Thanks so much for linking up this post at Thursday Favorite Things! I am featuring you today at the party. I hope you will come over and link up some more of your great ideas too!